It can be difficult to provide students with the necessary repetition of a concept while keeping it fun and motivating. This is one way I’ve tried to rev up our editing every once in awhile. I wear the hat (I know, I am weird) and hand out tickets. As students fix their errors they hand the ticket back. It keeps us laughing about mistakes but also attentive to details. Posted in writing and tagged editing, punctuation, Spelling, Writing. Bookmark the permalink. I like to keep things cyclical – remind kids regularly of things we have learned. It is good for bringing information from short term memory to long term. The problem is that I don’t remember what to ask about! The solution is the “ticket out the door”. Most days, as we work on something, I put a key concept on a small recipe card (I keep a stack nearby). The card gets added to an envelope with other recipe cards from previous lessons. The envelope is right next to the door. As students leave, I draw a card and they must answer the review question. Sometimes they must all answer the same question (whisper the answer to me), sometimes I ask each person to give me an example of the concept i.e. “everyone give me an example of a synonym before you leave”, and other times I draw one for each student ( a great review, too, for the others who hear all the questions and answers). Today I put two more envelopes by the door. These are words I word like students to regularly review. I will sometimes use these as the tickets out the door. 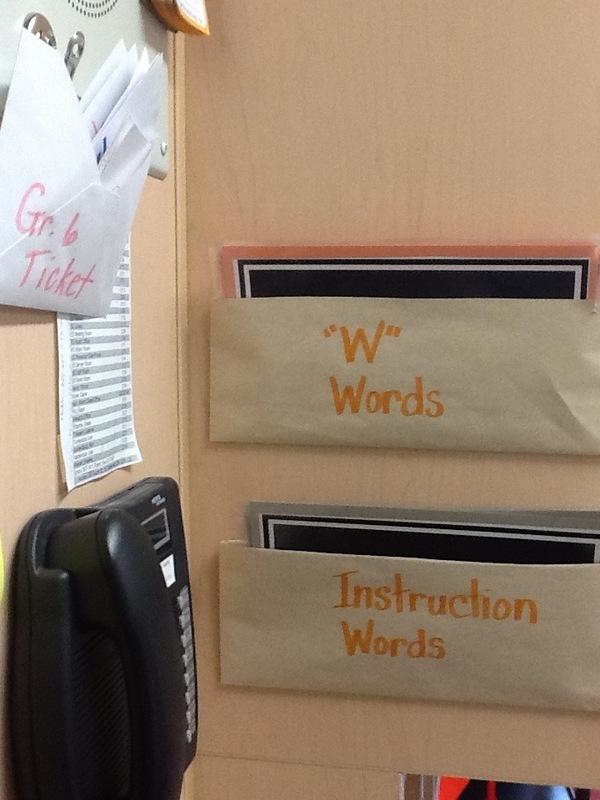 Posted in Reading, writing and tagged memory, sight words. Bookmark the permalink. Posted in writing and tagged indent, paragraphs, visuals. Bookmark the permalink. Students that struggle are often not using the appropriate strategies – strategies that good students utilize naturally. 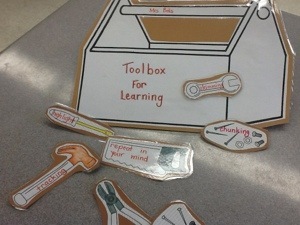 I made this toolbox so that I could display the appropriate strategy for the given activity. I want students to see that different activities require choosing a different strategy. Posted in Reading, writing and tagged strategies, visual. Bookmark the permalink. I am constantly thinking about how to isolate a skill. Turtle Talk has helped me isolate the blending skill for early intervention and then the idea grew to help with so much more. The idea is that the turtle talks so slowly that he only says one sound at a time. Early intervention starts, for me, with games of oral blending. This isolates the blending skill. I ask if the child can understand turtle talk and I proceed to make the sounds of the word and the student blends them together. I often use different colour unifix cubes and point to each one as I make each sound so that the student also has visual reinforcement of different, separate, sounds. I start with short, 3 phoneme words, and build up from there. 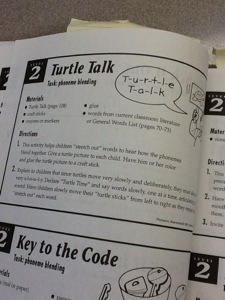 The second step is asking the student to do turtle talk, perhaps with an “eye spy” game. Third, once the first two are well on their way to being mastered, I will ask a child to say a word in turtle talk and then ask which letter matches each sound and I will write each letter as they go through the process. Fourth, students do the turtle talk and try to match and write each sound independently. As students get older I still refer to the turtle. To spell a word we will first count the individual sounds using turtle talk and then we will discuss how one sound might be spelled with two letters. 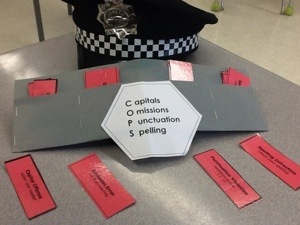 I have found that this reminder helps activate the memory of phonics skills that they have acquired. 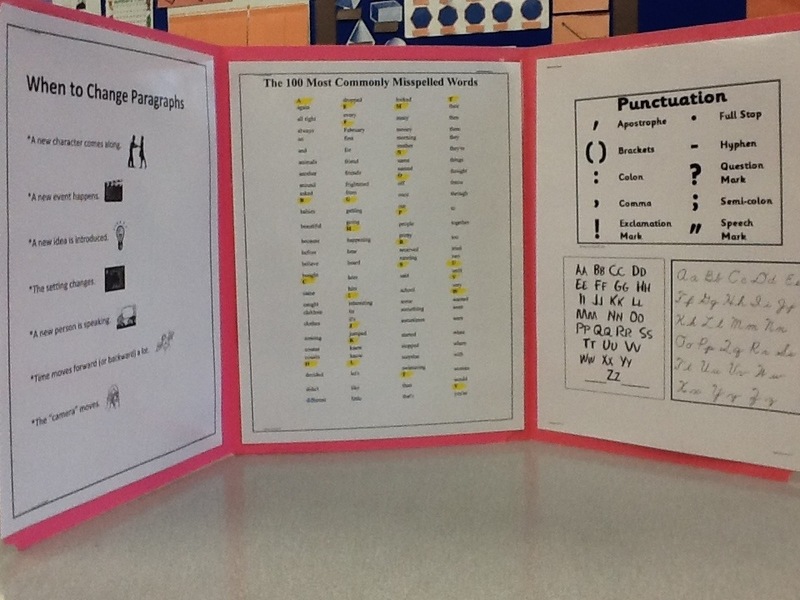 Posted in Reading, writing and tagged oral blending, phonemes. Bookmark the permalink. Working as the resource teacher has opened my eyes to the sensory needs of many students. This has been an area of some mystery to me – the student that wants to always stand very close to me and touch my arm, the child that smells my shirt each day, the boy that will only use my smooth eraser and not the bumpy one and the little girl that one day had a rainbow coloured nostril from sniffing smelly markers. Children that are over sensitive to noise. Children that love to chew things. We have started working this year with a new occupational therapist. I like her, I think she will bring about some great new things to try. I wish more of my students had access to her plans and strategies. 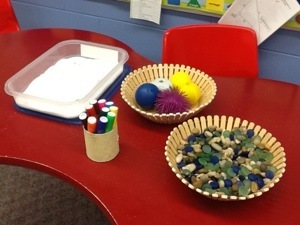 I have provided some sensory items to try and fill that need – a bit of an experiment for me. Posted in Uncategorized and tagged occupational therapy, senses, smell, Touch. Bookmark the permalink. 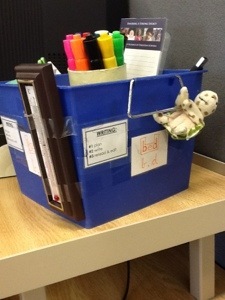 Today I put together these folders. I remember being in the university library and needing to read behind a study carrel or I could not focus – there were too many people to watch, friends to talk to and, well, pretty much anything seemed better than studying. These folders are to help my students focus. 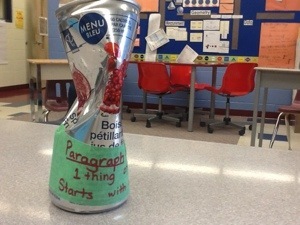 I added helps for paragraphs (an idea from Pinterest), spelling helps, and punctuation. These could also be used for privacy for a test or just as a signal to others that concentration is needed and talking is not a good option. I often tell my students that I had to use strategies to focus. A study carrel was one as well as giving myself a deadline to meet before meeting friends at the university coffee shop. I will still feel motivated by a really good cup of coffee! Posted in writing and tagged punctuation, work space, Writing. Bookmark the permalink.